Increasing amounts of lysates from HeLa cells transiently expressing DYKDDDDK-tagged THOC1 were separated on an SDS-PAGE and revealed using ABIN99294 as decribed in the protocol section (lanes 3 to 7). Transiently expressed DYKDDDDK-tagged THOC5 can is also be detected using ABIN99294 (lane 1). 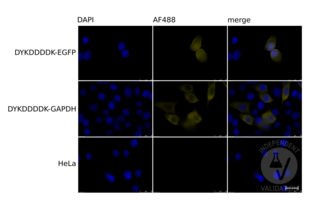 Untransfected HeLa cell extracts were used as negative controls (lane 2). Schauen Sie sich den Validierungsbericht #101368 für Western Blotting an. HeLa cells transiently expressing DYKDDDDK-tagged EGFP (top row) or GAPDH (middle row) and mock-transfected HeLa cells (bottom row) were stained using DAPI (left column) or DYKDDDDK Tag antibody ABIN99294 in combination with an AF488 conjugated secondary antibody (middle column). The right column shows merged DAPI and ABIN99294 staining. Schauen Sie sich den Validierungsbericht #101369 für Immunofluorescence an. Affinity Purified Antibody to detect conjugated proteins detects both C terminal linked and N terminal linked tagged recombinant proteins by western blot. This antibody was used at a dilution of 1:2,500 to detect 1.0 µg of recombinant protein containing either the epitope tag linked at the carboxy (C) or the amino (N) terminus of the recombinant protein. A 4-20% gradient gel was used to resolve the protein by SDS-PAGE. The protein was transferred to nitrocellulose using standard methods. After blocking, the membrane was probed with the primary antibody for 1 h at room temperature followed by washes and reaction with a 1:10,000 dilution of 800 conjugated Gt-a-Rabbit IgG (H&L) MX10 (code 611-132-122) for 30 min at room temperature. LICOR's Infrared Imaging System was used to scan and process the image. Other detection systems will yield similar results. Western Blot of Rabbit anti-FLAG antibody. Marker: Opal Pre-stained ladder . Lane 1: HEK293 lysate . Lane 2: HeLa Lysate . Lane 3: CHO/K1 Lysate . Lane 4: MDA-MB-231 . Lane 5: A431 Lysate . Lane 6: Jurkat Lysate . Lane 7: NIH/3T3 Lysate . Lane 8: E-coli HCP Control . Lane 9: FLAG Positive Control Lysate Lane 10: Red Fluorescent Protein . Lane 11: Green Fluorescent Protein . Lane 12: Glutathinoe-S-Transferase Protein Lane 13: Maltose Binding Protein . Load: 10 µg of lysate or 50ng of purified protein per lane. Primary antibody: FLAG antibody at 1ug/mL overnight at 4C. Secondary antibody: Peroxidase rabbit secondary antibody at 1:30,000 for 60 min at RT. Blocking Buffer: 1% Casein-TTBS for 30 min at RT. Predicted/Observed size: 55 kDa for FLAG. Passed. 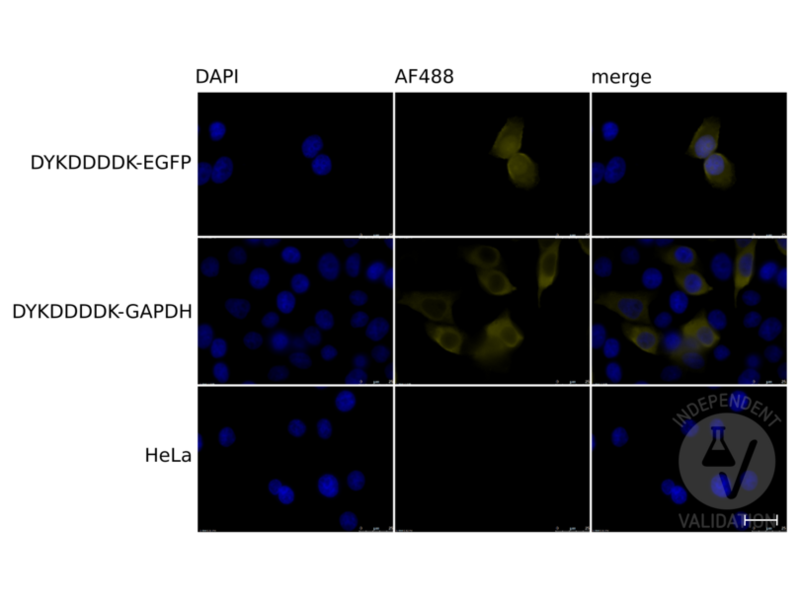 The DYKDDDDK Tag antibody ABIN99294 specifically recognizes DYKDDDDK-tagged proteins in HeLa cell extracts. HeLa cells are grown in DMEM/F12 W/L-GLUT (Thermo Fisher Scientific, 32500035) supplemented with 10% FCS (Amimed) and Penicillin-Strepomycin (BioConcept 4-01F00-H), at 37°C and 5% CO2 to 70-80% confluency. Transfect cells with an expression plasmids encoding DYKDDDDK-tagged THOC proteins using Lipofectamine 2000 (Thermo Fisher Scientific following the manufacturer´s instructions. Trypsinize cells, collect and count them. Lyse 107 cells in 1ml cold RIPA buffer (Cold Spring Harbour protocols) containing protease inhibitors (Biotool, B14003). Dilute the equivalent of 2x105 cells (20µl) 1:2 with 2x Laemmli SDS sample buffer and heat samples up for 5min to 95°C. Separate the denatured samples on a denaturing freshly cast polyacrylamide gel. Transfer proteins onto a nitrocellulose membrane (GE Healthcare). Block the membrane with TBScontaining 0.5% Tween 20 and 5% milk powder for 30min at RT. diluted 1:2000 in TBST 1h at RT or ON at 4°. Wash membrane 3x for 10min with TBST. Incubation with secondary antibody IRDye 800CW Goat anti-Rabbit (LiCor, 926-32211) diluted 1:10000 in TBST for 1h at RT. Reveal protein bands on a LI-COR Odyssey imaging system (LI-COR). 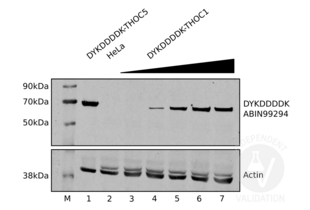 ABIN99294 proved a very good antibody for the detection of DYKDDDDK-tagged THOC proteins in Western blot. 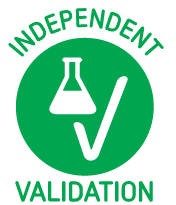 The antibody can be reused up to ten times as long as the incubation buffer contains some sodium azide. The antibody worked in various blocking buffers we tried containing milk or BSA and as well in Pierce WB enhancer. Passed. The DYKDDDDK Tag antibody ABIN99294 specifically labels DYKDDDDK-tagged proteins in HeLa cells in immunofluorescence. Prepare sterile 10mm cover slips (VWR, 631-1576) in empty 6-well plates. Seed 2x105 HeLa cells expressing DYKDDDDK-tagged proteins per well (6-well plate) onto the cover slips one day prior to fixation and let them grow in DMEM/F12 W/L-GLUT (Thermo Fisher Scientific, 32500035) with 10% FCS (Amimed) and antibiotics (Penicillin-Strepomycin 4-01F00-H, Bioconcept) at 37°C and 5% CO2 to 60-80% confluency. Remove culture medium and fix the cells with 1.5ml/well 4% PFA for 20-30 min at RT. Wash samples 3x 5min with TBS (20mM Tris-HCl, pH 7.5, 150mM NaCl). Incubate cells with permeabilization/blocking buffer for 30-60 min at RT. Incubate slides with primary rabbit anti-DYKDDDDK Tag antibody (antibodies-online, ABIN99294, lot 33451) diluted 1:200 in 100µl TBS++ (1xTBS, 0.1% Triton X100, 6% serum (or BSA 1.25gr/250mL PBS)) ON at 4°C. A negative control was incubated without primary antibody. Take the slides out of the fridge and leave them for 2h at RT. Wash slides 3x 5min with TBS++. Incubate slides with secondary chicken anti-rabbit AF488 antibody conjugate (Thermo Fisher Scientific, A-21441) for 1.5h at 37°C. Incubate slides for 30min at RT. Wash slides 2x with TBS. Counterstain with 100μL DAPI diluted to 100ng/ml in TBS for 10min at RT. Wash slides 3x with TBS. Add a drop of homemade Mowiol on the slide and mount the coverslips. Cover the borders with nail polish to fix the coverslips to the side. Take images on a Leica DMI6000 fluorescence microscope. Staining of transiently expressed DYKDDDDK-tagged EGFP and GAPDH with ABIN99294 resulted in the expected staining pattern. Immunogen This antibody was purified from whole rabbit serum prepared by repeated immunizations with the Enterokinase (ECS) peptide DYKDDDDK (Asp-Tyr-Lys-Asp-Asp-Asp-Asp-Lys) conjugated to KLH using maleimide. Residues of glycine and cysteine were added to the carboxy terminal end to facilitate coupling. This antibody reacts with DYKDDDDK conjugated proteins. Hintergrund Epitope tags are short peptide sequences that are easily recognized by tag-specific antibodies. Due to their small size, epitope tags do not affect the biochemical properties of the tagged protein. Most often, sequences encoding the epitope tag are included with the target DNA at the time of cloning to produce fusion proteins containing the epitope tag sequence. This allows Anti epitope tag antibodies to serve as universal detection reagents for any tag-containing protein produced by recombinant means. This means that anti-epitope tag antibodies are a useful alternative to generating specific antibodies to identify, immunoprecipitate or immunoaffinity purify a recombinant protein. The anti-epitope tag antibody is usually functional in a variety of antibody-dependent experimental procedures. Applikations-hinweise This antibody is optimally suited for monitoring the expression of DYKDDDDK tagged fusion proteins. As such, this antibody can be used to identify fusion proteins containing the DYKDDDDK epitope. The antibody recognizes the epitope tag fused to either the amino- or carboxy- termini of targeted proteins. This antibody has been tested by ELISA and western blotting against both the immunizing peptide and DYKDDDDKä containing recombinant proteins. Although not tested, this antibody is likely functional for immunoprecipitation, immunocytochemistry, and other immunodetection techniques. The epitope tag peptide sequence was first derived from the 11-amino-acid leader peptide of the gene-10 product from bacteriophage T7. Now the most commonly used hydrophilic octapeptide is DYKDDDDK. 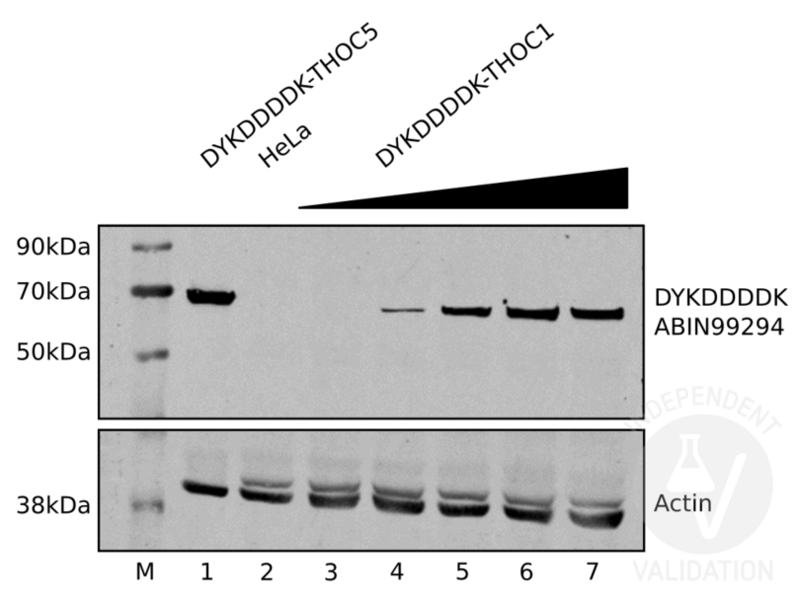 polyclonal antibody to detect DYKDDDDK conjugated proteins binds DYKDDDDK containing fusion proteins with greater affinity than the widely used monoclonal M1, M2 and M5 clones, and shows greater sensitivity in most assays. Affinity purification of the polyclonal antibody results in very low background levels in assays and low cross-reactivity with other cellular proteins. Produkt verwendet in: Gassen, Hartmann, Zschocke, Stepan, Hafner, Zellner, Kirmeier, Kollmannsberger, Wagner, Dedic, Balsevich, Deussing, Kloiber, Lucae, Holsboer, Eder, Uhr, Ising, Schmidt, Rein: "Association of FKBP51 with Priming of Autophagy Pathways and Mediation of Antidepressant Treatment Response: Evidence in Cells, Mice, and Humans." in: PLoS medicine, Vol. 11, Issue 11, pp. e1001755, 2014 (PubMed). Rufener, Mühlemann: "eIF4E-bound mRNPs are substrates for nonsense-mediated mRNA decay in mammalian cells." in: Nature structural & molecular biology, Vol. 20, Issue 6, pp. 710-7, 2013 (PubMed). Allgemeine Veröffentlichungen Urano, Ichikawa, Morikawa, Yoshida, Koyanagi, Komano: "T cell-based functional cDNA library screening identified SEC14-like 1a carboxy-terminal domain as a negative regulator of human immunodeficiency virus replication." in: Vaccine, Vol. 28 Suppl 2, pp. B68-74, 2010 (PubMed).